Although Algeria may at first appear to be an uninteresting country, which, for the most part, covers the desert, the opposite is true. The former French colony hides many different places that are definitely worth a visit. And do not think it’s a backward country. Algeria is one of the two African countries to lead the metro. How it works and how you can use it can be found in the following articles. What can’t be missed when you visit Algeria? The ancient town of Tipaza undoubtedly belongs to the places you should visit. An unforgettable experience is guaranteed by the UNESCO mark, and another attraction is that this city is a former shopping center that historically fell under Rome. When visiting this sunny country you should certainly not omit Algeria, which is often called Paris Africa. This is so because the architecture of the city combines the two main elements – the narrow streets of Islamic culture influenced and inspired by the wide boulevards of the French capital. If you are a real gourmand, definitely do not miss a visit to another city, Annabe. It is renowned for its cuisine, which combines traditional European and Arabic tastes. The city of the rocks, formerly known as Cirta, is another interesting monument of Algeria. You would now find it under the name of Constantine. And what does this town look like? Just across the center of the city is just a rocky gorge that flows through the river. The two banks of the city combine several bridges that together create unforgettable panoramas. Book your accommodation in Algiers! Metro can only be found in Algiers, the capital of Algeria. It has only one line and was first introduced to the public seven years ago. The total length of the entire metro system is 9.2 km. 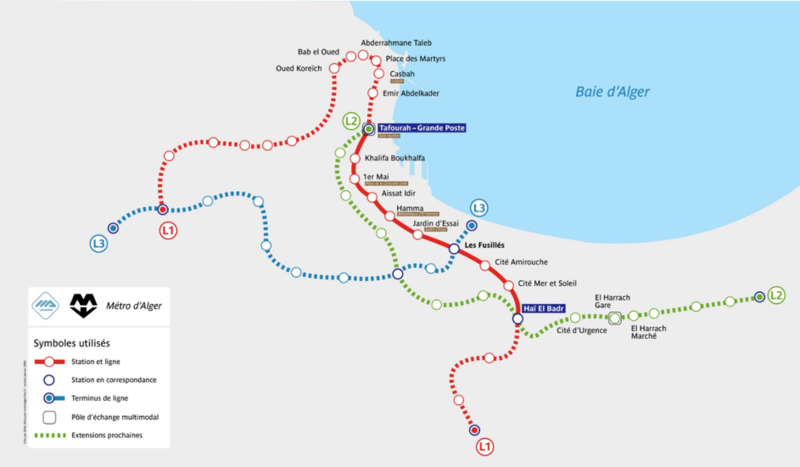 Line 1 connects Tafourah-Grande Poste and Hai El Badr. 9 of the 10 stations are underground and the platform is 115 meters wide. Trains run with 14 wagons with a total length of 108m and a transport capacity of 1216 people. The transport system is capable of transporting up to 41,000 people per hour. Trains run at intervals of 2 minutes and the metro is 5 to 23 hours. In addition to the Algiers subway, bus transport works great, making you not only around the city center but also on the outskirts of the city. One ticket costs around 20 dinars and you can buy it personally at a vendor. There is also a taxi in the city. You can call him only on the street or in the places where the taxi is usually standing. For us Europeans, it is a relatively inexpensive way of transport, and taxis are on every corner. However, it is important to arrange the price in advance, otherwise, you are at risk that your local taxi drivers will get you more money than you would like. However, we recommend that you use the UBER application, where you have the first free coupon for free! We hope that this article will help you navigate the Algerian metropolis and that you will not lose it in Africa. If you are interested you can tell us your impressions from Algiers below in the comments and just add some photos.